The center wing section is lifted into position to be installed on the Sikorsky JRS-1 in the Mary Baker Engen Restoration Hangar at the Udvar-Hazy Center in Chantilly, Virginia. Museum collections specialists mount the right-hand engine on the Sikorsky JRS-1 float plane inside the Mary Baker Engen Restoration Hangar at the Steven F. Udvar-Hazy Center in Chantilly, VA. This photo was taken on August 20, 2012. This JRS-1 is the only aircraft in our collection that was stationed at Pearl Harbor on December 7, 1941. Museum Collections staff prepare to lift by crane one of two 750-horsepower Pratt & Whitney R-1690 air-cooled radial engines for mounting on the Sikorsky JRS-1 float plane as visitors watch from the overlook. The aircraft is being assembled inside the Mary Baker Engen Restoration Hangar at the Steven F. Udvar-Hazy Center in Chantilly, VA. This photo was taken on August 20, 2012. This JRS-1 is the only aircraft in our collection that was stationed at Pearl Harbor on December 7, 1941. Museum collections staff mount the right engine on the Sikorsky JRS-1 float plane inside the Mary Baker Engen Restoration Hangar at the Steven F. Udvar-Hazy Center in Chantilly, VA. This photo was taken on August 20, 2012. This JRS-1 is the only aircraft in our collection that was stationed at Pearl Harbor on December 7, 1941. Collections staff mount the right engine on the Sikorsky JRS-1 float plane inside the Mary Baker Engen Restoration Hangar at the Steven F. Udvar-Hazy Center in Chantilly, VA. This photo was taken on August 20, 2012. This JRS-1 is the only aircraft in our collection that was stationed at Pearl Harbor on December 7, 1941. The second of two Pratt & Whitney R-1690 engines is prepared for mounting on the Sikorsky JRS-1 float plane inside the Mary Baker Engen Restoration Hangar at the Steven F. Udvar-Hazy Center in Chantilly, VA. This photo was taken on August 20, 2012. This JRS-1 is the only aircraft in our collection that was stationed at Pearl Harbor on December 7, 1941. The Sikorsky JRS-1 with floats installed is almost fully assembled inside the Mary Baker Engen Restoration Hangar at the Steven F. Udvar-Hazy Center in Chantilly, VA. This photo was taken on August 31, 2012. This JRS-1 is the only aircraft in our collection that was stationed at Pearl Harbor on December 7, 1941. The Sikorsky JRS-1, just after floats were installed, is almost fully assembled inside the Mary Baker Engen Restoration Hangar at the Steven F. Udvar-Hazy Center in Chantilly, VA. This photo was taken on August 31, 2012. This JRS-1 is the only aircraft in our collection that was stationed at Pearl Harbor on December 7, 1941. 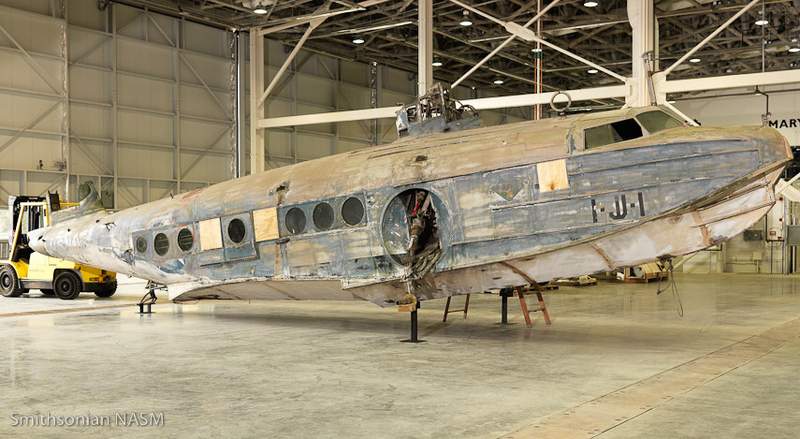 Remembering Pearl Harbor with the only survivor of the December 7, 1941 attack in our collection, the Sikorsky JRS-1. The aircraft is being reassembled in our Mary Baker Engen Restoration Hangar at the Steven F. Udvar-Hazy Center and is on view from the visitor overlook. 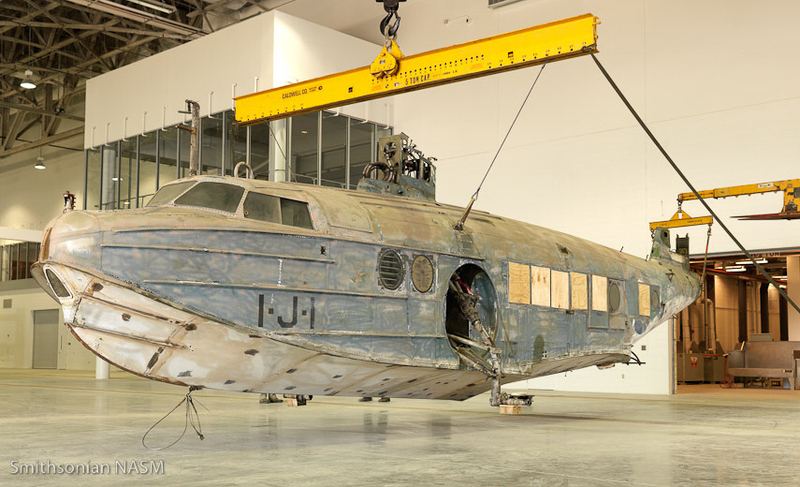 Museum technician Patrick Robinson talks about restoration plans for the Sikorsky JRS-1, the only Pearl Harbor survivor in the collection. This Sikorsky JRS-1 is the only aircraft in the museum collection that was stationed at Pearl Harbor on December 7, 1941. The JRS-1 "flew" briefly as it was removed from the transport truck and touched down in the Mary Baker Engen Restoration Hangar in the spring of 2011. The Sikorsky JRS-1 arriving at the Mary Baker Engen Restoration Hangar at the Museum's Steven F. Udvar-Hazy Center. In what may be the last “flight" of the JRS-1, the team steadies the fuselage in preparation for rotating it 180 degrees. On March 8, 2011, the Sikorsky JRS-1 was transferred from the Museum's Paul E. Garber Preservation, Restoration and Storage facility in Suitland, MD to the new Mary Baker Engen Restoration Hangar at the Steven F. Udvar-Hazy Center in Chantilly, VA. Here, the Sikorsky JRS-1 is backed into the Mary Baker Engen Restoration Hangar for offloading. On March 8, 2011, the Sikorsky JRS-1 was transferred from the Museum's Paul E. Garber Preservation, Restoration and Storage facility in Suitland, MD to the new Mary Baker Engen Restoration Hangar at the Steven F. Udvar-Hazy Center in Chantilly, VA. Here, the Sikorsky JRS-1 fuselage arrives at the Udvar-Hazy Center. After a job well done, the team that moved the aircraft pose in front of the Sikorsky JRS-1, now in position inside the Mary Baker Engen Restoration Hangar. Collections staff prepare to offload the Sikorsky JRS-1 inside the Mary Baker Engen Restoration Hangar at the Steven F. Udvar-Hazy Center. Collections Specialist Doug Erickson is interviewed while Public Affairs Specialist, Frank McNally, looks on. Museum Technician, Pat Robinson, grabs a strap to help steady the aircraft as it is lifted off of the flatbed trailer. March 8, 2011. On March 8, 2011, the Sikorsky JRS-1 was transferred from the Museum's Paul E. Garber Preservation, Restoration and Storage facility in Suitland, MD to the new Mary Baker Engen Restoration Hangar at the Steven F. Udvar-Hazy Center in Chantilly, VA. Rather than remove the engines from their mounting rings, Collections staff pulled the engine mounts from the nacelles at the front of the wing. This allowed them to rotate each engine vertically and utilize the four point mount itself as a stand. On March 8, 2011, the Sikorsky JRS-1 was transferred from the Museum's Paul E. Garber Preservation, Restoration and Storage facility in Suitland, MD to the new Mary Baker Engen Restoration Hangar at the Steven F. Udvar-Hazy Center in Chantilly, VA. 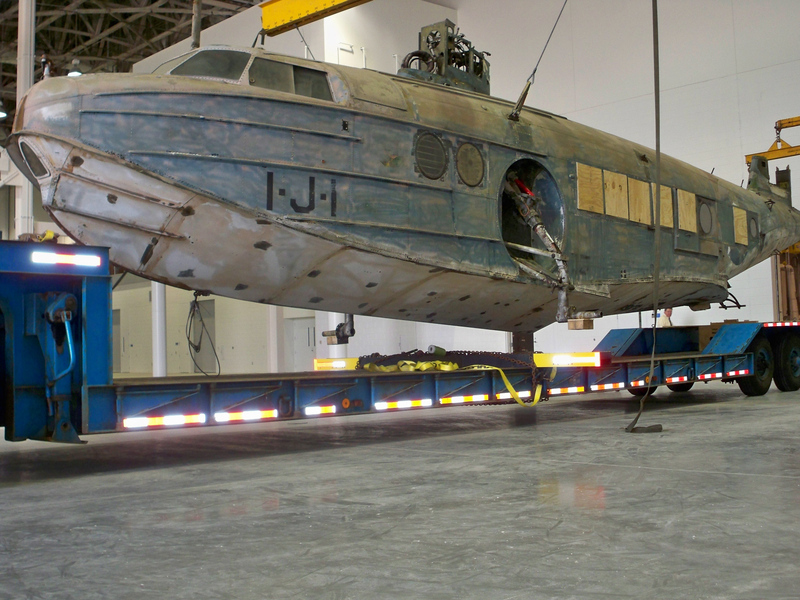 Here, the Sikorsky JRS-1 hull is secured to transport trailer. Sikorsky JRS-1 in storage at the Paul E. Garber Facility. Collections staff remove the Sikorsky JRS-1 wing center section in preparation for the move from the Museum's Paul E. Garber Facility to the Mary Baker Engen Restoration Hangar at the Steven F. Udvar-Hazy Center. This Sikorsky JRS-1 is the only aircraft in the national collection that was stationed at Pearl Harbor on December 7, 1941. Sikorsky completed the airplane, construction #4346, on July 12, 1938. The company delivered it, the thirteenth built, to the U.S. Navy on July 28. The Navy assigned the aircraft to Utility Squadron One (VJ-1) at Naval Air Station San Diego, California, on August 3, 1938. It is the sole surviving JRS-1 amphibian. From NAS San Diego, a navy crew flew the JRS-1 to Pearl Harbor, Hawaii, in July 1940, where it was assigned to Ford Island. Ten JRS-1 amphibians were at the base when the Japanese attacked. All survived. They were immediately pressed into service and flew many missions patrolling for Japanese submarines and searching for the enemy fleet. The only armament these airplanes carried were depth charges to attack submarines and were only modified to carry weapons after the December 7 attack. The Museum's JRS-1 stopped flying these missions on September 5, 1942. The aircraft was shipped to California for a complete overhaul. Following this work, the Navy assigned it to the Commander Fleet Airship Wing 31 at Moffett Field, California, on August 21, 1943. The airplane was struck from active service August 31, 1944, with a total of 1,850 flying hours logged on the airframe. The National Air Museum officially accepted it into the collection at the Silver Hill Facility (now Paul Garber Facility) in Suitland, Maryland, on November 9, 1960. The JRS-1 remained at the Garber Facility until March 8, 2011 when it was moved to the Mary Baker Engen Restoration Hangar at the Udvar-Hazy Center near Dulles Airport.